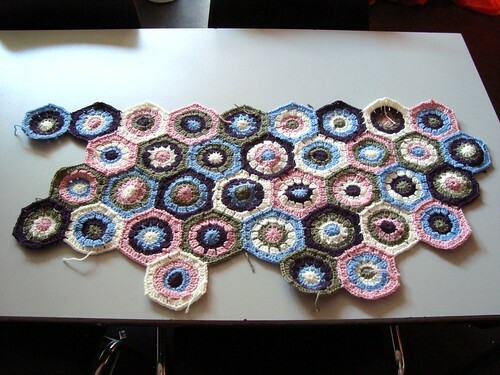 Pattern of the week: thinking of… puff hexagons! 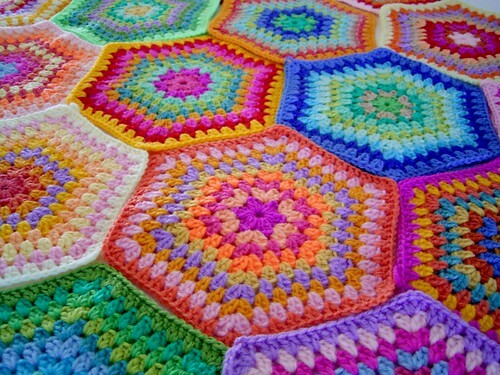 Posted in crochet, Free pattern, hexagon blanket, Pattern of the week	by Giulia P.
When I saw this on ravelry it was instant love! 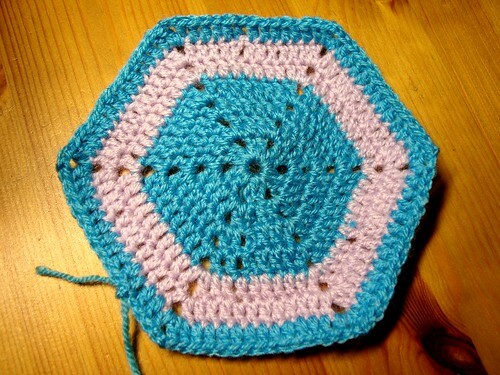 You know I love crocheting, and hexagons always look pretty neat… so yay for this pattern! 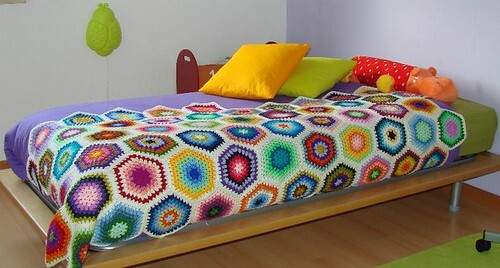 Posted in Afghan Blanket, crochet, hexagon blanket	by Giulia P.
– Finishing date (ext): anytime before Xmas!!! Did you miss me? lol I have been crocheting like crazy lately, so much that I think I’ll need a wrist/elbow transplant soon I have just decided to take a couple of days off from my crocheting fever to rest my back a bit, so here I am with a couple new post and funny projects to show you! Remember my previous post about Hexagons ? 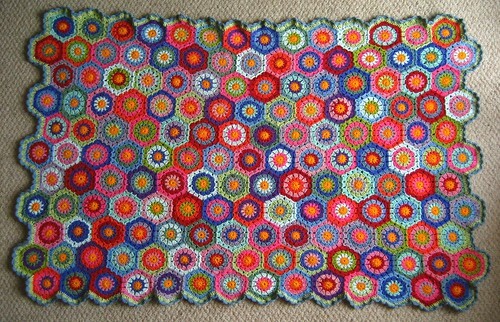 In a sudden creativity explosion I decided to make such a blanket (but more a knee rug actually) for my mum this Xmas. I went buying some yarn the other day with my boyfriend but I totally *effed* it up. Our livingroom in Italy is all in neutral colours, cream, orange and coffee brown, so I figured such a colour combination would be an asset for the blanket as well. My fave yarn store in Maribor (Slovenia) didn’t have ANY of those colours in a soft bulky yearn which would make the blanket something affordable and easy to make. So I bought just one orange, brown and cram skein of wool/acrylic blend to try and well, I really didn’t like the result. The hexagons were stiffy and riculously small. I would have needed 3 years to come out with anything in the size of a blanket! So I went back to the store the following day and I got to change the yarn I didn’t use. I decided to change colours completely and went for a sweet pink, turquese, cream, purple and green. I thought that choosing 5 colours for a pattern that requires 4 for each hexagon would give me a nice turnover without adding too many colours and I think I was right! These are the 20 hexagons I made in a 24 hours crocheting marathon 🙂 Considering that I also ate, slept and went to the cinema watching Julie & Julia in the meantime (eheh) I think they work quite fast! What do you think? Any feedback on the colour choice? I am pretty proud of the fact that so far no hexagon is looking like another. 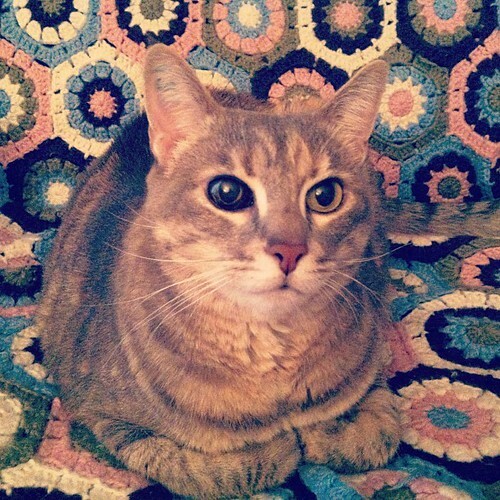 Posted in Afghan Blanket, crochet	by Giulia P.
I joined the Flickr group hexagon love a while ago and it’s been super inspiring! 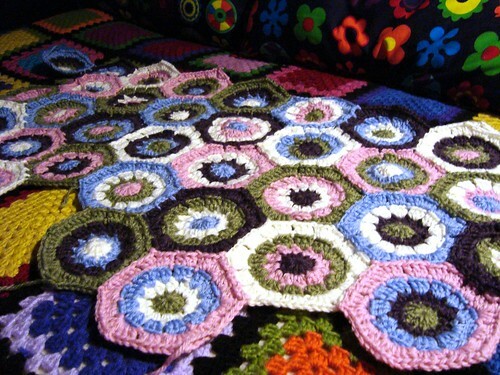 Such a blanket could really cheer you up on a bad day 🙂 I have in mind to make such a cool one in the future, I just need to find the right colours! She is a true artist and her works are so bright and colourful! So, as you can see, I’m an hexagon freak and I had to try and make at least one! I used 2 random colours from my stash, since this is just a try, but I’m pretty happy with the pattern I came up with, cute eh? 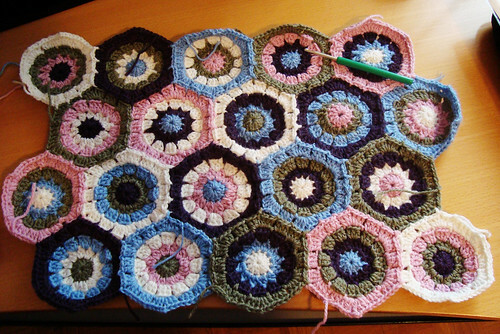 I’m going to start my first hexagon blanket as soon as I finish the 2 ones I’m working on right now!